Well, we have been back from vacation for 4 days and it has rained every day. It is pouring rain right now as I type. I guess that I can’t complain since two weeks in Oregon were beautiful, sunny and warm. It really feels like fall here which makes me a little sad since our summer seems to fly by and is over before I know it. I think it really feels like fall because my vacation is over and it is so darn rainy and cold. I have to tell myself that there are still a couple of weeks left in August….I hope it starts to feel like August soon. I haven’t been blogging much lately, but I do have a line up of posts started with some cooking that we have been doing. I also have a few recipes on the camera ready to download. My goal is to get caught up before fall when my nesting for winter starts….canning and freezing. I really should be a homesteader. That would be my dream, a self sufficient farm with animals and gardens all around. Can you tell I am really agonizing about going back to the office tomorrow. 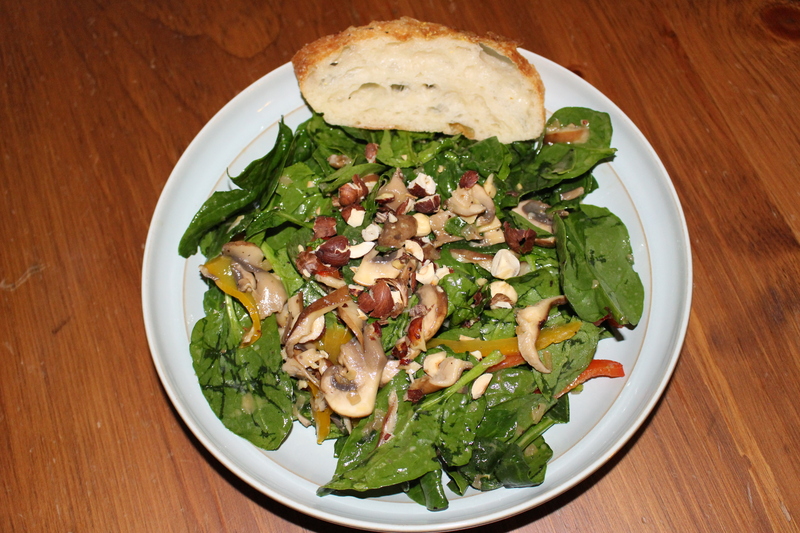 Meanwhile back in reality, a few weeks ago, when Evie was away for supper I made this salad. 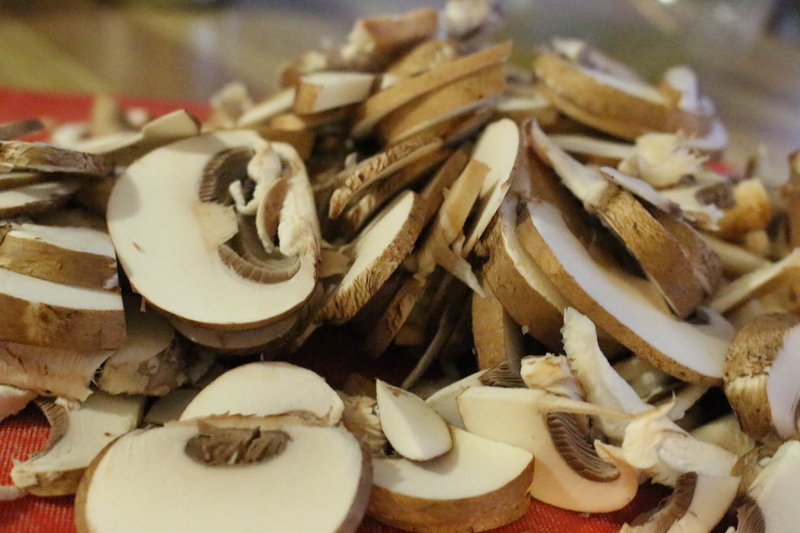 When Evie is away for a meal we usually have a meal centered around mushrooms. I love mushrooms and Evie hates them. 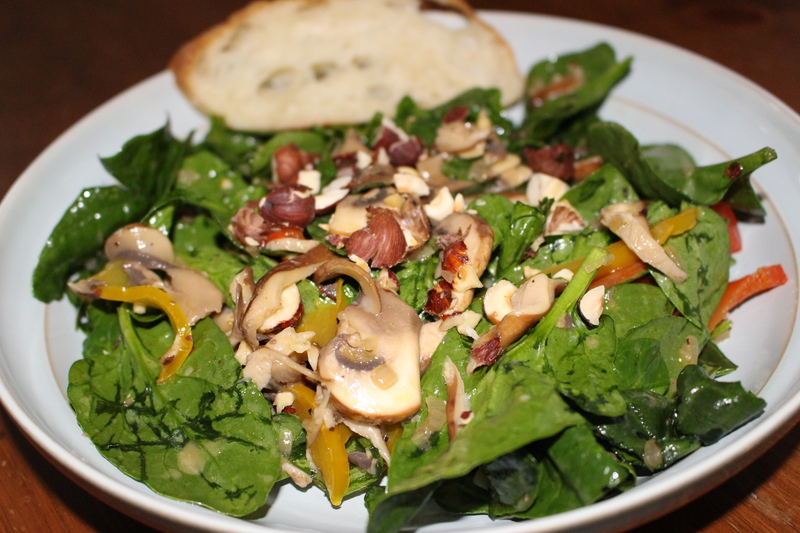 This salad is so incredibly good, I cannot even explain it. 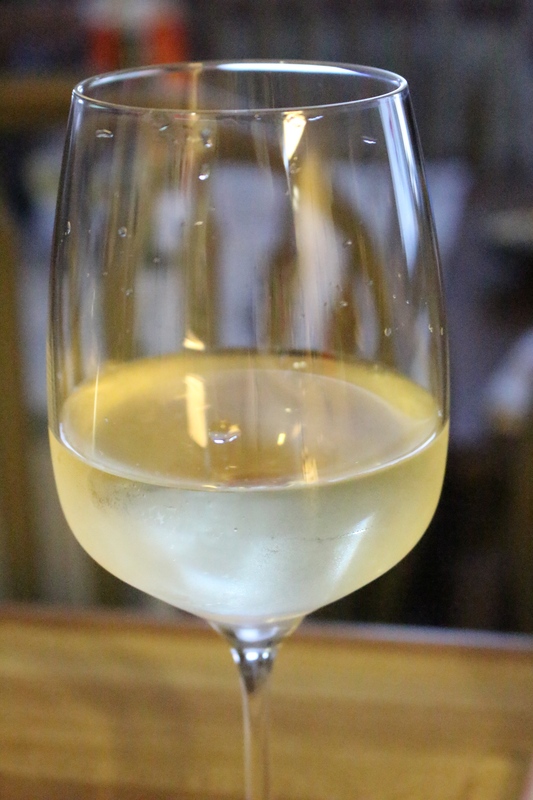 First start with a cold glass of your favourite white wine. Not for the salad, that was for me, and it goes nice alongside the salad. When uploading the pictures I notice that I took a lot of extremely close up pictures, not sure what mindset I was in that day, maybe artistic or maybe it was just the wine!…likely the wine. 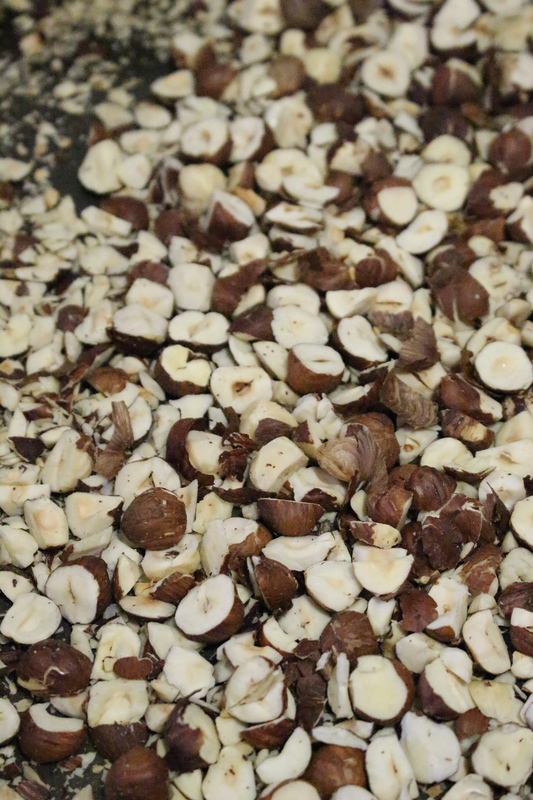 To toast just chop, put in a baking dish and roast in the oven on about 200F, tossing every few minutes, until they just start to colour and you begin to smell them. Watch closely they are high in oil so they can burn quickly. The above picture is before toasting. The picture further down is after toasting. 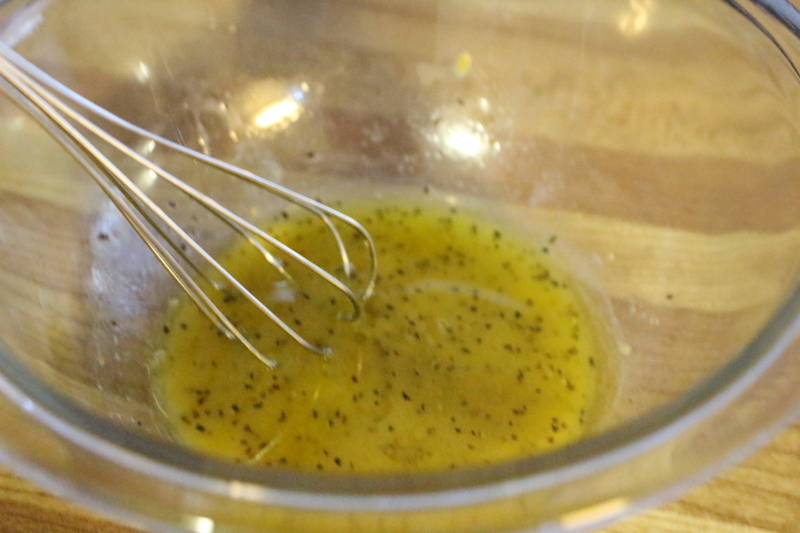 In a small bowl whisk together 2 tbsp oil, 1 tbsp white wine vinegar, 1/2 tsp dijon mustard, 1/2 tsp salt, 1/4 tsp pepper (or you can just do salt and pepper to taste). 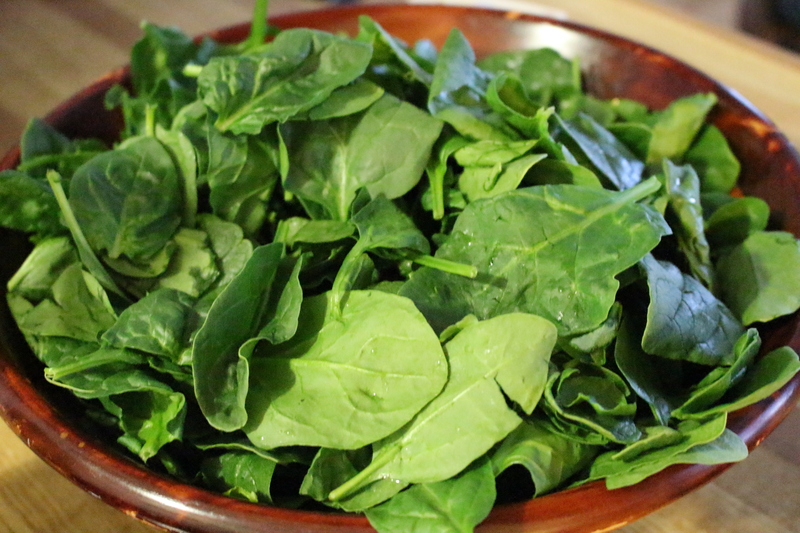 Clean about 8 cups of spinach, tear of stems and place in a large bowl. 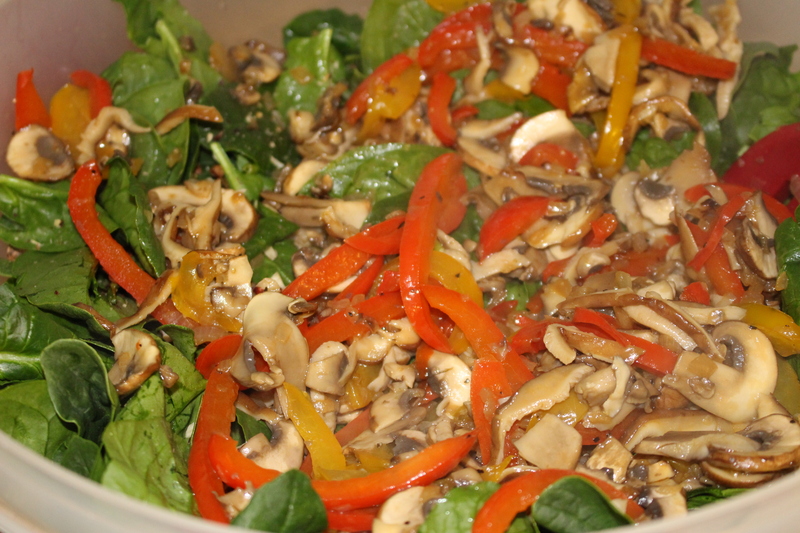 I used two bunches of baby spinach. Seed and thinly slice the peppers. Peel and finely mince the shallots. 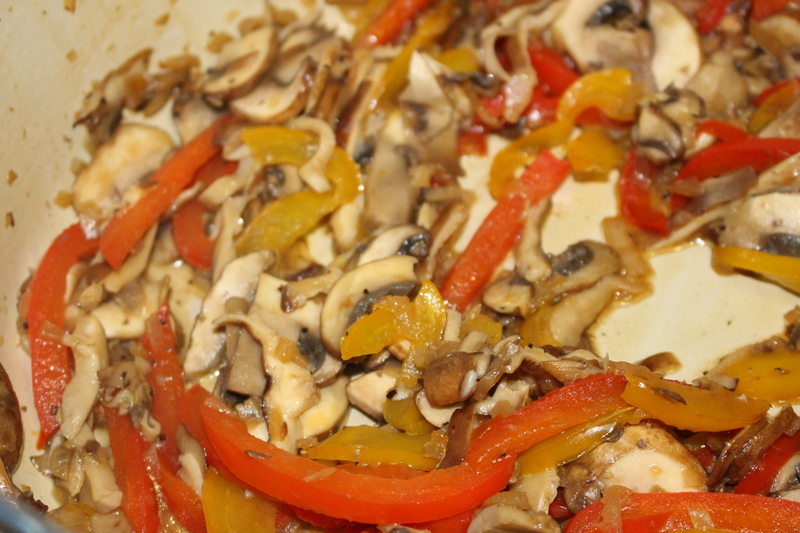 Heat oil in pan, ad peppers and sauté for 2 minutes until softened then add shallots and mushrooms sauté about 3 minutes until softened. 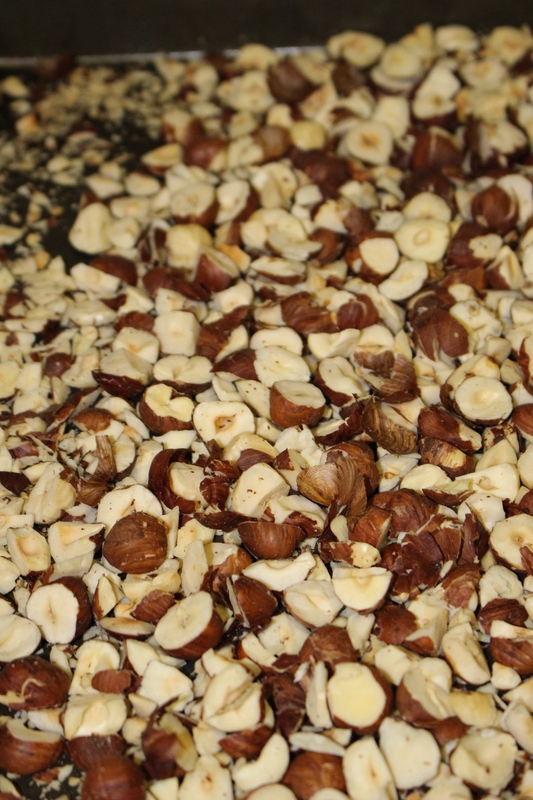 Set aside half of the nuts after they have been toasted. 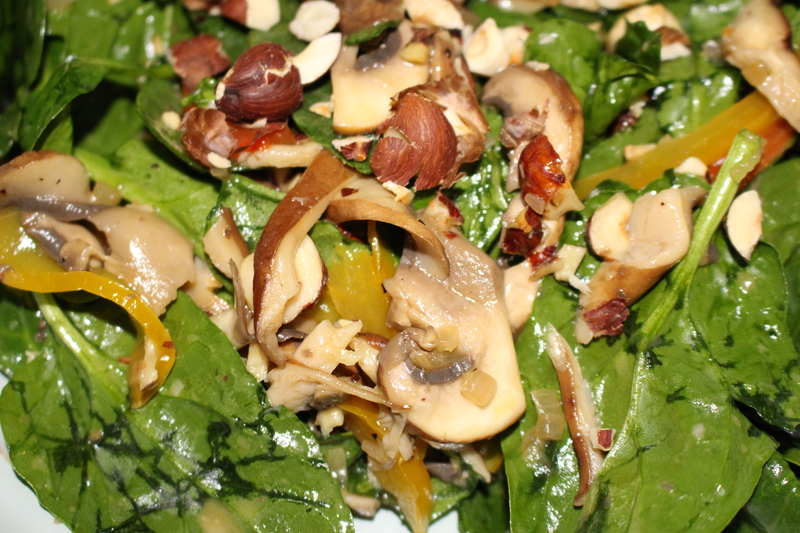 To the spinach add the warm vegetable mixture, half of the nuts and dressing. Toss to coat. 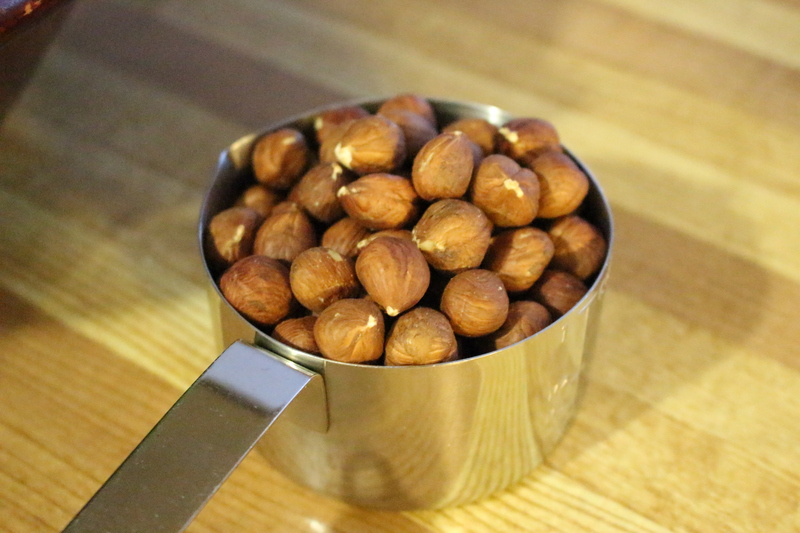 Serve immediately and sprinkle each serving with some of the reserved nuts. Good with baguette and white wine. 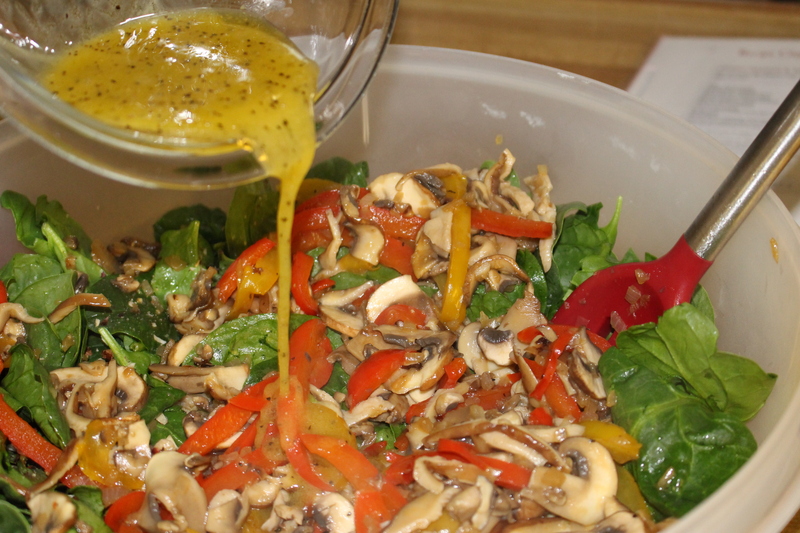 I hope you try this salad, it is absolutely delish. FYI: I give credit for this recipe to an LCBO Food and Drink Magazine from way back in 2006, I wrote that in the corner of the page in my book! I think I have adapted it a little but that is where I found the original recipe. Hope it feels like summer where you are. Thanks for the nice comments and the follow. I hope you enjoy the recipes. I am very much enjoying your recipes and I will certainly be trying them out for myself very soon!.